After his impressively strong third-place finish in the Iowa caucuses on Monday, Sen. Marco Rubio appeared poised to emerge as the Donald Trump-alternative the GOP could rally around. Yet in Saturday night's debate, the remaining Republican governors in the race managed to throw the Florida senator off his game and stay competitive ahead of the crucial New Hampshire primary. Chris Christie rips into Marco Rubio's "memorized 25-second speech"
"Let's remember something" New Jersey Gov. Chris Christie said on the Manchester, New Hampshire debate stage. "Every morning when a United States senator wakes up, they think about what kind of speech can I give or what kind of bill can I drop? Every morning, when I wake up, I think about what kind of problem do I need to solve for the people who actually elected me?" Bush slams Trump for trying to "take property from an elderly woman"
Christie came out of the gate swinging, ready to blunt Rubio's momentum ahead of the February 9 primary, because the future of his presidential bid rests on performing well on the Granite State. Ohio Gov. John Kasich has also staked his campaign on a strong New Hampshire showing, but he took a different tack than Christie. Rather than pummeling the rising star of the GOP primary, Kasich cast himself as an effective optimist, capable of unifying the Republican Party and the nation. "I've done now over 100 town hall meetings, and I've loved every second of it," Kasich said in his closing remarks. "I've listened to your stories, and I've had your hugs, and I've seen your tears, and I've seen you walk away and say, I now have hope. You know, I've had a conservative message, but a positive message -- not just a conservative message, but a positive message about how we can bring people together, how we can restore America's strength." Both Christie and Kasich carved out opportunities to highlight their achievements as governors, making strong closing arguments before the New Hampshire primary. Yet if they do well enough to continue their campaigns on to South Carolina, it may be because Rubio choked under pressure. Early on in the debate, Christie attacked the senator for repeatedly using "the memorized 25-second speech that is exactly what his advisers gave him." Specifically, Christie was referring to Rubio's remarks that begin with, "Let's dispel with this notion that Barack Obama doesn't know what he's doing." Just a few minutes later, Rubio repeated himself, nearly word for word, prompting Christie to remark, "There it is. There it is. The memorized 25-second speech. There it is, everybody." Even as Christie called him out, Rubio tried time and again to resuscitate those well-worn lines. 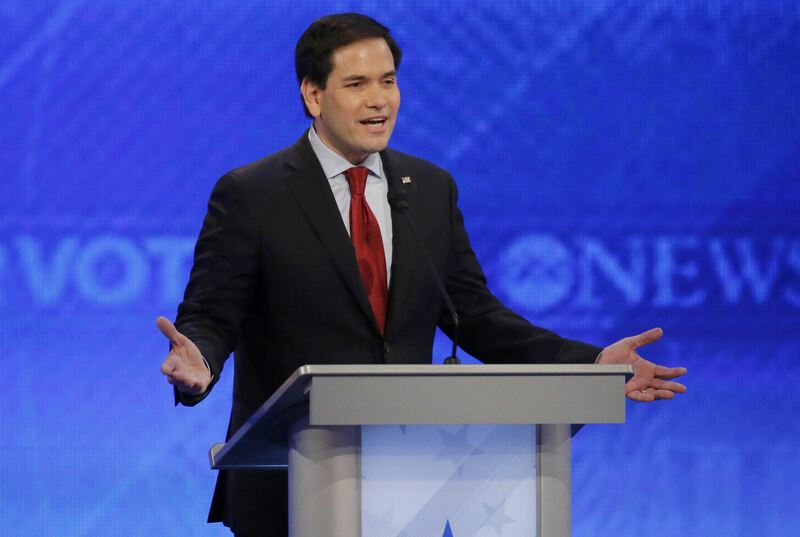 Eventually, the audience started booing whenever Rubio urged them to "dispel this notion" about President Obama. Meanwhile, opposition research teams wasted no time highlighting the fact that he sounded like a broken record. Along with Christie and Kasich, former Florida Gov. Jeb Bush managed to hold his own on the debate stage, with strong answers on issues like taxes. "I would like to see more millionaires," Bush said to applause when asked what he'd say to the majority of Americans who think millionaires should pay more in taxes. "I think we need to grow more millionaires, we need create a prosperity society where people can rise up. This notion that somehow we're undertaxed as a nation is just foolhardy, when we have entitlements growing far faster than our ability to pay for it. A conservative, because that's the point of this, believes in limited government, believes in a entrepreneurial capitalism and a strong national defense." As for Trump himself, the front runner was focused on taking jabs at Ted Cruz, who managed to defeat him in the Iowa caucuses. After Cruz's closing remarks at the end of the debate, Trump couldn't help but chime in with, "He got Ben Carson's votes, by the way," reminding voters of the deceitful way the Cruz campaign led some in Iowa to believe Carson had dropped out of the race. Cruz early on was asked by debate moderators about his prior comments that Trump doesn't have the temperament to be president. When Cruz deflected, Trump responded, "I respect what Ted just said, but if you noticed, he didn't answer your question." Trump won applause for his observation, adding, "That's what's going to happen with our enemies and the people we compete against." Later on in the debate, Cruz danced around the question of whether he would revive the practice of waterboarding. "I would not bring it back in any sort of widespread use," he said to doubtful murmurs from the audience. Trump, meanwhile, managed to elicit a few enthusiastic cheers with a more extreme but bluntly honest response: To deal with the likes of ISIS, he said, "I would bring back a helluva lot worse than waterboarding."